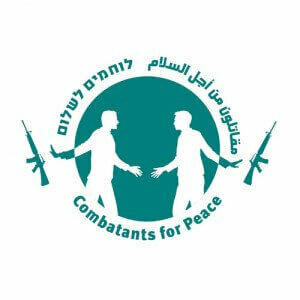 Combatants for Peace (CFP) is a binational movement founded in 2005 by Palestinians and Israelis who had taken an active part in the cycle of violence, and are now working together to break it. Combatants for Peace is committed to nonviolent activism. The movement believes that violence only leads to more violence and that the national conflict cannot be resolved through military means, by either of the parties, but rather through joint nonviolent action. By “nonviolent,” CFP does not mean passivity, but rather a mode of struggle that is intended to change the political reality. The two national groups in Combatants for Peace have a certain degree of autonomy to manage their affairs in accordance with the Movement’s creed and goals, but still taking into account the political, social and cultural considerations of both groups. While acknowledging the asymmetry and inequality in the political situation in the region, with Israel being by far the stronger party, the movement challenges these power relations and allocates equal authority to Palestinians and Israelis within it. Combatants for Peace is based on dialogue, but it is not a dialogue group. Dialogue is a means to consolidate the movement and make it into a powerful political platform, capable of influencing political reality. Since CFP members see the occupation as the manifestation of the conflict and the main source of violence between Israelis and Palestinians, the movement’s immediate goal is to work toward its end. Given the asymmetry in power relations between the parties, CFP focuses more on addressing the Israeli public. Nonetheless, CFP believes that the Palestinian side, too, carries responsibility for the conflict and its future. Thus, CFP sees its task as advancing a space in which Israelis and Palestinians can work together on the ground while not losing contact with the mainstream of their respective societies. CFP activity is intended to bring together growing numbers of people from both sides, and ultimately to foster the recognition that the occupation and its incumbent violence are ruinous for the future of all. CFP urges the political leadership to take bold steps and resume serious negotiations to end the conflict and desist from taking unilateral steps aimed at placing obstacles in the face of this goal and prolonging the conflict, including the construction of settlements in the West Bank and East Jerusalem, whose purpose is the perpetuation of the conflict and the blocking of any chance of real peace. CFP calls for the establishment of an independent Palestinian state with its capital in East Jerusalem, based on the border of June 4, 1967, alongside Israel. The movement’s vision is that the two countries will exist side by side in peace, security and good neighborly relations. The core of Combatants for Peace is bi-national groups of local activists operating in different areas of the West Bank and Israel. Each of these groups is in itself an example of Israeli-Palestinian partnership and acts as a regional base for various activities, including tours in the Occupied Territories, which expose Israelis to the daily realities of the occupation; joint protest actions and peace rallies, which bring together Israelis and Palestinians, enhance solidarity and promote mutual trust; and house meetings, which are held frequently and serve as a main tool for conveying CFP’s message to both publics. In its protest and solidarity activities, CFP uses nonviolent methods like those championed by “Theatre of the Oppressed,” the American group Bread and Puppet, and more. Among other things, CFP is involved in assisting villagers and other Palestinian residents who experience unjustified difficulties as a result of the occupation. The movement has become deeply involved with the area around Nahleh, located South of Bethlehem and east of the Jewish settlement of Efrat. In this area land is being illegally confiscated and large-scale housing programs are planned in what constitutes yet another attempt by the Israeli government and the settler movement to cut off the Bethlehem area from the Hebron region and thus put another severe obstacle on the road to peace and a viable Palestinian state. In addition to group-level activities, Combatants for Peace holds activities for the general public: house meetings and lectures to audiences on both sides and tours designed to expose Israelis to as many different aspects as possible of the military rule in the territories. For example, “Learning for Peace” is a series of public events seeking to advance a deeper understanding of different aspects and dimensions of the reality of the conflict, to explore nonviolent ways of struggling against the occupation, and to introduce CFP to the public. Since 2015, the Israel Office of the Rosa Luxemburg Stiftung has been hosting “Learning for Peace” events on its premises. The largest public annual event held by Combatants for Peace is the Alternative Israeli-Palestinian Memorial Day Ceremony, a public event held in Tel Aviv on the eve of the Israeli Memorial Day, which is comprised of speeches, testimonies and musical performances, with both Israeli and Palestinian speakers and artists. This event seeks to challenge the consensual narrative cultivated by the state-choreographed ceremonies, emphasizing that war is not an unchangeable decree and that it is in our power to stop the violence and prevent further bloodshed and killing. Combatants for Peace has been holding the ceremony since 2006, attracting a growing audience. In 2015, 3,200 people attended and more than 5,000 watched the ceremony on the Internet. The Israel Office of the Rosa Luxemburg Stiftung has been supporting CFP’s joint alternative Memorial Day ceremony since 2011.